At Roman Noon, the report became reality: the Pope accepted the resignation of Cardinal Francis George for reasons of age, naming Blase Cupich the Ninth Archbishop of Chicago. As previously relayed, the archbishop-elect will be introduced at a 9.30am Central press conference at the Archbishop Quigley Center, now the Chancery of the nation's third-largest diocese. Livestreams, etc. will follow here then. 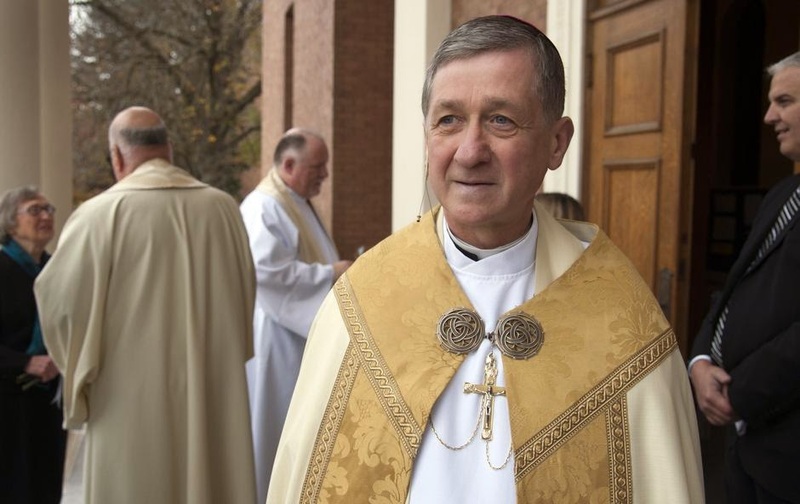 Cupich's installation in Holy Name Cathedral has been set for Tuesday, November 18th. On a wider level, meanwhile, the last 48 hours have now brought what could well end up being Francis' two most consequential appointments of his entire pontificate in the English-speaking church. As reaction goes, suffice it to say, the phone didn't stop ringing from around 2pm yesterday 'til well past midnight. And while the Stateside bench's centrist-progressive bloc was greatly cheered and the more conservative wing is deeply concerned, the one thing everyone had in common was being utterly stunned, both at the choice and its arrival on a timeline far quicker than anybody expected. Putting one key question to rest, asked about Cupich's proficiency in Spanish for a 2.3 million-member archdiocese now in range of a Hispanic majority, a longtime friend said "He doesn't have it." 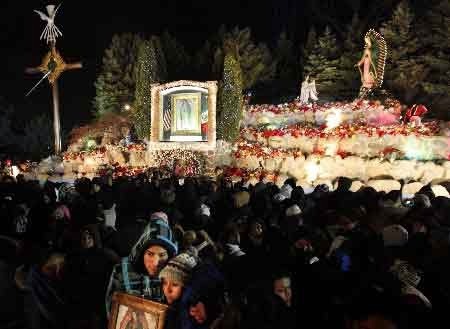 Here, it's worth reminding that Chicago is home to what's become American Catholicism's largest annual event – the 36-hour Guadalupe feast at the shrine in suburban Des Plaines, which has drawn as many as 250,000 people over recent December 12ths. For purposes of context, the Des Plaines shrine – a small chapel sharing the grounds of a facility for special-needs kids – barely existed when Francis George was named archbishop. Now, routinely drawing crowds of 7,000 or more on any given weekend, the push is on to build a church on the site that would rival Washington's Basilica of the National Shrine of the Immaculate Conception and LA's Cathedral of Our Lady of the Angels as the nation's largest. A century ago, the Windy City's first cardinal tackled the needs of the future in quickly building the grandest seminary these shores had ever seen. And now, seventy-five years to the month after Mundelein's death, the newest incarnation of "The Catholic Bishop of Chicago, A Corporation Sole" faces the same task for a different age: to power the Des Plaines project to completion. Lastly for now, the universal question that's come up over these last hours has been how Cupich entered Francis' radar to become the Pope's defining pick for the US hierarchy's top rank. On this front, two things stick out. First, as a young locale at the DC Nunciature (1981-87), the now archbishop-elect was secretary to the future Cardinal Pio Laghi, who had been Nuncio to Argentina during the years of the "Dirty War" of the 1970s. As Jesuit provincial in that period, Jorge Bergoglio would've known Laghi – an immensely popular figure as John Paul II's legate to the States – and the now-Pope's respect for him has clearly remained intact. Secondly, meanwhile, in early June Cupich was tapped to give the lead response at a Catholic University of America conference on the Catholic response to libertarianism, which was keynoted by Francis' ever-present "Vice-Pope," Cardinal Oscar Rodriguez Maradiaga SDB of Tegucigalpa. While the slot brought a high profile by itself for the Spokane prelate, a friend in USCCB circles termed the reply that emerged as "the finest thing any American bishop has written about Francis." Cardinal Rodriguez Maradiaga’s knowledge of this topic, as we have just witnessed, is nothing short of encyclopedic. Both broad and deep, he has put on full display not only his grasp of Catholic Social Teaching but also the new insights of Pope Francis. The Church offers her teaching as a service, and I would add, as an invitation to people of good will, and is ever committed to a dialogue that is respectful of others’ position. In that spirit I want to lift up three points from the Cardinal’s presentation to contribute to the dialogue. I will conclude with a word about the urgency of effectively responding to a libertarian approach to the economy and politics. For Francis the human person seeks and claims an integral development, morally, spiritually and emotionally, which is joined intrinsically to the communities that sustain him. For the Pope’s critics, the human person is the autonomous individual, man the producer and man the consumer. For Francis inclusion and economic security for all are measures of economic health in contrast to the one-dimensional measure of economic growth proposed by his critics for decision making in the growing age of globalization. For Francis, politics seeks the common good. For his libertarian critics, politics seeks to maximize the freedom of markets and individual choice. For Francis the strength of globalization leads to the need for global structures that help mold the forces of market capitalism to advance solidarity and dignity for all. For libertarians market forces left to themselves are the best arbiters of economic progress. Secondly, the Cardinal also draws attention to the unique contribution Pope Francis makes to Catholic Social Teaching by using as his starting point real life experience rather than competing ideas. In other words the Pope offers a different epistemology, a different approach to how we know and learn or better how we are informed. In fact, as the Cardinal notes, some of the Pope’s critics say that his views on the economy are wanting precisely because he speaks out of the limited experience of living in Argentina with its difficult economic and political history or that he is just uninformed about capitalism and a market economy, especially its claims of reducing global poverty. But, I think those who easily dismiss what the Pope is saying because of his turn to real life experience fail to appreciate that he is calling people to a more authentic way of knowing and learning. He is challenging them about how they are informed. And, in fact, herein lies what I believe is how we should understand his unique contribution to the tradition of Catholic Social Teaching. Instead of approaching life from the thirty thousand feet level of ideas, he challenges policy makers and elected officials – indeed all of us - to experience the life of everyday and real people. His pithy phrase in the Joy of the Gospel says it all: Reality is greater than ideas. Ideas cannot be disconnected from realities; the two must be in dialogue. He is concerned that leaders and policy makers “are stuck in the realm of pure ideas” thus disconnected from realities. Ideas are important as they can classify and define, but realities call us to action. Living in the world of ideas only, without being tethered to reality, is a particular risk for leaders in the West and especially in the U.S. We can become quite content to quote statistics, sift through and interpret data, categorize populations, all the while remaining indifferent to and unaware of the needs of real people. To paraphrase the Pope, this approach is a dead end, for it only creates “ethical systems bereft of kindness” and carries on “intellectual discourse bereft of wisdom.” Much like he told religious leaders, Francis is saying that politicians and policy makers need to know the smell of the sheep, otherwise their objectives will be more ideal than real, and reality will be masked in empty rhetoric using “a rationality foreign to most people.” In our country and particularly in an era when campaign fundraising absorbs so much of an elected official’s time, the Pope’s words are particularly challenging. But they are also a challenge to any of us who, already having our place at the table of life, find it more secure to speak of the economy in the world of ideas rather than risk testing them by visiting the reality of the excluded and marginalized – thereby making sure that ideas do dialogue with reality. My final point is directed to Catholics and believers in our country who are challenged by the pope’s words about income distribution, protection of worker’s rights, and the role of governments in regulating the economy both nationally and internationally. First, it is worth noting that these precise topics were dealt with specifically by Benedict XVI in Caritas in Veritate. But, even more importantly, Pope Francis is not interested in providing an economic plan or system. Rather, his first goal is to call believers, call us all, to a renewed encounter with the Risen Christ, so that our lives may be marked by the joy that sets us “free from sin, sorrow, inner emptiness and loneliness” to the point that we are compelled to invite others to enter into and participate in that same encounter, life and joy. Everything else for the believer is relative. Everything else, our economy, politics, social programs, our life styles are all measured by how they help or hinder others in participating in the life God has destined for humanity and in experiencing God’s loving encounter. The Pope isn’t asking us to give over our wallets but to give over our lives to bringing about the Kingdom of God in our midst. This is not about adopting an economic system that stifles personal initiative and creativity, nor for that matter is it about baptizing a market driven economy to the point that it sends the message, especially to our youth, that it is ok to organize your life around trying to make as much money as you can as long as you occasionally are generous to the needy. No, the Pope’s invitation is much more profound: Is sharing with others the joy of our encounter with Christ our priority? Or do we seek to deal with our sin, sorrow, emptiness and loneliness on our own terms? And specifically when it comes to inviting the poor to participate in the life God is calling us all to share, we have to deal with their real life situation not only that they are in want but that they are excluded. It is within this context that he calls for a shift from an economics of exclusion to a culture of encounter and the need for accompaniment. One encounters another, not one self. One accompanies another, not one self. This emphasis on encounter and accompaniment unmasks the difficulty with libertarianism, for its stated goal is to increase human autonomy as the priority. I want to close with a note of urgency. Listen to the sage advice of this warning about the full impact of economic liberalism on the moral life: In a world like the West, where money and wealth are the measure of all things, and where the model of the free market imposes its implacable laws on every aspect of life, authentic Catholic ethics now appears to many like an alien body from times long past, as a kind of meteorite which is in opposition, not only to the concrete habits of life, but also to the way of thinking underlying them. Economic liberalism creates its exact counterpart, permissivism, on the moral plane. Who is this prophet? Cardinal Joseph Ratzinger as quoted in 1985. The Ratzinger Report, p. 83. My second note of urgency is that while many have been lifted out of poverty, the numbers of people not just poor but trapped in poverty and exclusion are staggering. Global communications however is a game changer as young people today and even more in the future, living with no hope yet tantalized by what they see in the world of opulence, will be challenged to deal with rising expectations in a non-violent way. But, I believe we are already sitting on a powder keg that is as dangerous as the environmental crisis the world is facing today. I do not have to reach across the world, however, for reasons to be concerned as a pastor. I live on the campus of a major Catholic university and know first-hand the weight faculty and administration feel as they try to redirect students beyond a materialistic approach to life in the face of overwhelming forces and inertia. Like Pope Francis, I know that the great danger these young people and my parishioners face, “in today’s world, pervaded as it is by consumerism, is the desolation and anguish born of a complacent yet covetous heart, the feverish pursuit of frivolous pleasures, and a blunted conscience.” I know how their interior life is at risk in a world that encourages them to be caught up in their own interests, leaving no room for others, no place for the poor, so that “God’s voice is no longer heard, the quiet joy of his love is no longer felt, and the desire to do good fades.” I see this in the apathy towards immigration reform and attitudes of indifference about the new immigrants who are forced to live in the shadows, explicitly excluded, and, since my days in South Dakota, in the disinterest in the plight of native peoples whose suffering and injury are generational. So for me, as a pastor, this is not just an academic debating exercise, there are serious concerns about libertarianism that impact the pastoral life. The Fathers of the Second Vatican Council declared that the Church embraces her role in the modern age of being “at once a sign and a safeguard of the transcendent character of the human person.” Gaudium et Spes 76. Pope Francis, while making some ground breaking developments for Catholic Social Teaching is tethered to a rich tradition of taking up that task by challenging economic and political approaches which fall short of placing human dignity in all its fullness as the priority. Rerum Novarum was the utter repudiation of a process of industrialism that claimed the freedom to let markets atomize society and deform the richness of our humanity. Catholic Social Teaching in the present moment with the insights of Pope Francis, constitutes the challenge to a corresponding atomization and deformation through globalization.